This book makes me deeply happy. I've never been shy about my love of Neil Gaiman's books, nor have our other contributors, and long did I look forward to the day when I could share Neil Gaiman with my children. I showed them Coraline and one of my kids immediately said they wanted to get it on DVD, a wish I accommodated with great joy, but since then the memory of the spider has been too much, I guess, and the DVD has sat upon the shelf collecting dust. So I tried reading them Coraline, but again, it seems the memory of the spider from the movie was a little too much, and we stopped shortly after we started. Someone recommended The Graveyard Book, telling me, "Things that scare adults don't seem to really scare kids that much." I took a look, and that one begins with a kid's parents being knife-murdered in the night, and I just decided to skip it. Then one day I was at Target probably looking for the latest Wimpy Kid book, and I saw a lone copy of Fortunately, the Milk sitting all by itself in the wrong place on the book rack. I hadn't heard of it, and started reading right there in the aisle. I made it a handful of pages in, and knew this was my big chance! 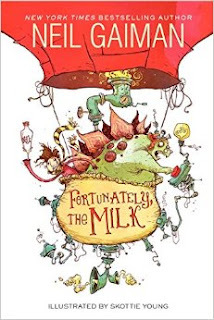 Fortunately, the Milk reads like Roald Dahl meets Douglas Adams, and was every bit as fun for me to read as it was for the kids to listen to me read. It is filled with Gaiman's usual wit, and does fun things with the idea of an unreliable narrator, which adds a level of manageable complexity you don't often find in this kind of kids' chapter book. Normally I'd do the whole "Math" section here and grade the book, but I don't know how to do that with a kids' book. I mean, if you're an adult and a fan of Gaiman, this book will be a fun, but probably forgettable, way to divert yourself for an hour or so. But if you're the parent of elementary-aged (or younger, I guess) kids and want to share your love of speculative fiction and imagination with them, for my money this book deserves a place of pride on your shelf alongside The Phantom Tollbooth. And that is high praise, indeed. Reference: Gaiman, Neil. Fortunately, the Milk [HarperCollins, 2013]. Posted by Vance K — cult film reviewer and co-editor of nerds of a feather, flock together since 2012, musician, and Emmy-winning producer.